FILE - White House strategist Steve Bannon speaks during the Conservative Political Action Conference in Oxon Hill, Md., Feb. 23, 2017. Former White House chief strategist Steve Bannon vowed Friday that he would be "going to war" for President Donald Trump as he returns to Breitbart News, the ultra-conservative publication he chaired before taking part in Trump's campaign and presidential administration. Bannon spoke to Bloomberg News just hours after news broke that he was leaving his job as the president's most controversial adviser. "If there's any confusion out there, let me clear it up: I'm leaving the White House and going to war for Trump against his opponents — on Capitol Hill, in the media and in corporate America," Bannon said to Bloomberg. Bannon also spoke with The Weekly Standard on Friday. "The Trump presidency that we fought for, and won, is over," he said, shortly after confirming his departure. "We still have a huge movement, and we will make something of this Trump presidency. But that presidency is over. It'll be something else. And there'll be all kinds of fights, and there'll be good days and bad days, but that presidency is over." Breitbart News confirmed that Bannon would return to the publication as executive chairman. White House press secretary Sarah Huckabee Sanders said Chief of Staff John Kelly had signed off on Bannon's departure. The two men "mutually agreed today would be Steve's last day," she said in a statement. "We are grateful for his service and wish him the best." Bannon, who is credited with helping Trump get elected on his "America First" and "Make America Great Again" slogans, had clashed for months with other powerful West Wing figures. Bannon, according to The New York Times, insisted the parting of ways was his idea and that he submitted his resignation to the president 11 days ago in preparation for an announcement at the start of this week. The announcement was delayed, however, in the wake of the violent protests in Charlottesville, Virginia. The West Wing of the White House, from the first day of the Trump administration, has been plagued by fighting between two camps. Bannon led the faction that embraced Trump's populist and isolationist messaging. That pitted him against a more traditional cadre of Republicans who wanted to focus on improving the U.S. economy and boosting America's strength overseas — a group that Bannon derided as the "globalists." Trump, not seen as ideological, let the two opposing factions battle it out. 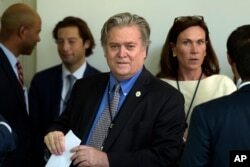 "The Bannon wing has had significant policy successes but also was associated with President Trump's greater policy failures and communications missteps," Duke University political science professor Peter Feaver said. Traders at the New York Stock Exchange loudly cheered the news of Bannon's dismissal, and stock prices on the exchange immediately rebounded. FILE - White House strategist Steve Bannon waits for President Donald Trump to make a statement about the U.S. role in the Paris climate accord, June 1, 2017, in the Rose Garden of the White House. Bannon was parodied on satirical American TV programs as a puppetmaster controlling Trump, or even as a towering Grim Reaper, the personification of death. For many Democrats, Bannon was viewed as the one swaying Trump to his worst instincts. "Bannon finally gone. Now he can march w/ the whole crowd: neo-Nazis, white supremacists, Klan while knowing it will still find favor in Oval" Office, tweeted U.S. Representative Gerry Connolly, a Virginia Democrat, minutes after the top official's ouster was announced. Trump, on Tuesday, had praised Bannon as "a good person," saying the strategist was not racist. "The anti-globalist wing of the Republican Party will most certainly view Bannon's firing as a betrayal by Trump," political strategist Evan Siegfried predicted. "I would not be surprised to see Breitbart ramp up attacks on White House officials like Gary Cohn, Dina Powell, General [H.R.] McMaster and, perhaps, even the president himself," said Seigfried, author of the book GOP GPS: How to Find the Millennials and Urban Voters the Republican Party Needs to Survive. Cohn is the president's chief economic adviser; Powell is the deputy national security adviser for strategy; McMaster is the national security adviser. "The GOP civil war is about to get much louder," Seigfried told VOA. Bannon, a former investment banker, is widely expected to return to Breitbart News. "If he goes back to Breitbart, he will have a very large megaphone that will amplify his voice," Feaver, a former National Security Council special adviser for strategic planning and institutional reform, told VOA. "But it is much harder to influence policy from the outside than it is from the inside. And when you're outside criticizing the administration, it sounds like your criticizing President Trump, and President Trump doesn't respond well to that." 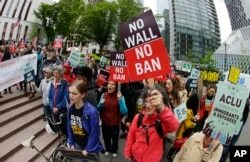 FILE - Protesters wave signs and chant during a demonstration against President Donald Trump's travel ban, outside a federal courthouse in Seattle, Wash., May 15, 2017. Bannon was a key architect of the administration's travel ban on people from several Muslim-majority nations. In an interview published Wednesday in The American Prospect magazine, Bannon cheered Trump's widely criticized remarks on the Charlottesville violence as a political plus for the president. He argued the president's response was enmeshing Democrats in identity politics, making it easier for the White House to pursue economic nationalism. However, with the exception of the far right, there has been unanimous criticism of Trump's defense of white nationalists rallying against removal of a Confederate statue as a disaster for the administration and a possible inflection point that could cripple his presidency. During the interview, Bannon said the United States was in an economic war with China and called for the country to be "maniacally focused on that." He also said that "there is no military solution" to the nuclear crisis with North Korea. That comment prompted a repudiation the following day from Secretary of Defense James Mattis. Bannon's effacing of Trump's own threats to Pyongyang may have been the final act of insubordination for both Chief of Staff Kelly, who is a former Marine Corps general, and the president himself.